This week, I was at ON24’s Webinar World 2017 in San Francisco. It was packed full of tips, tricks, best practices, and case studies, presented by marketers from both ON24 and their customers. I took over forty pages of notes so it was rich in content and well done. Does this slide make you believe she cares about this presentation? It looks like what it is. Just text on a slide with no thought to her audience – good thing she did on purpose to make her point. This is a better option, don’t you agree? It is not what you say but how you say it. Which one of the next two slides works? A or B? The second one is a great example of how you say it. Here are two pictures of jeeps. Which one would you take a ride in? What do they mean? Yikes, I would be very hesitant to take a ride in this beat-up jalopy. But the one below looks well cared for. Kate made the connection that it looks like this Bronco owner cares about their vehicle. We need to care about design. She told us that she believes that the right design gives you and your message more creditability. Think outside the box both in design and how you share content. Kate stresses that content is king. If you don’t bring value to the content than it doesn’t matter how it looks. Her favorite strategy and a good place to start is to “Keep Your Design Bright and Tight”. To keep it “bright”, it must be “lively, engaging and smart”. Then you marry that with “tight”, organized, strategic, and targeted. Makes sense? 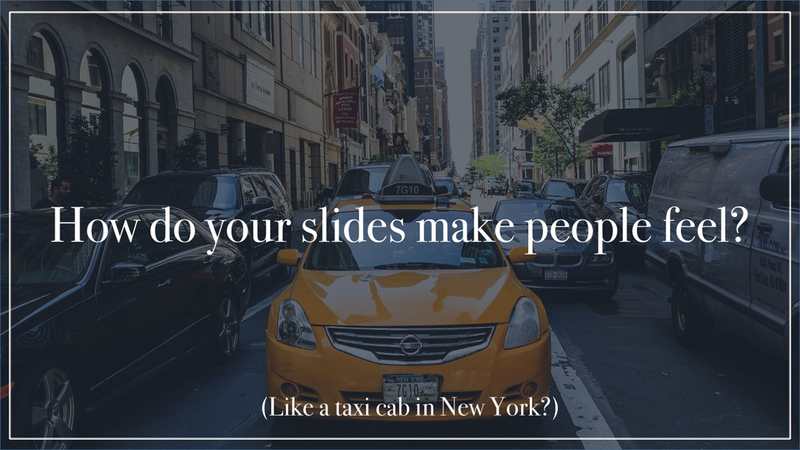 Do your slides measure up? 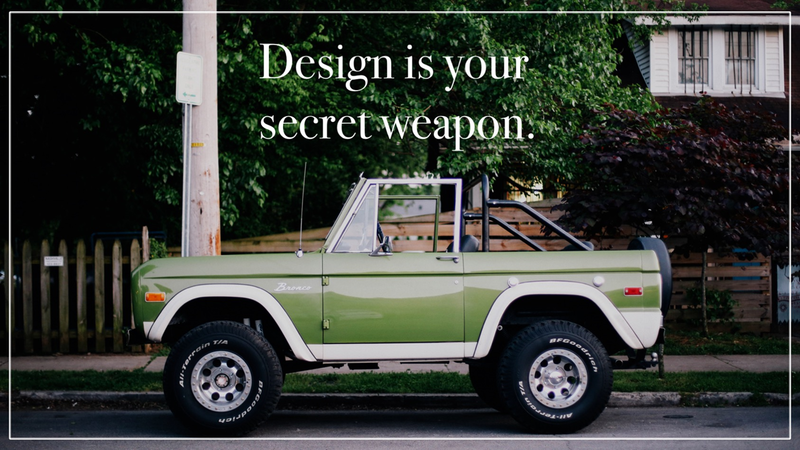 We know about working with the Brand Police and why branded templates give life to themes. Kate shared some great examples of how using a theme or analogy could be a great way to tell your story in a fun and creative way. One of the campaigns mentioned above, Stellar eMail Marketing, used the analogy of space and the stellar theme to deliver key messages. They were clever and make an impact. She shared another one around a baseball theme – see below. They are clever and stand a better chance of appealing to a larger audience because they are interesting. Stock Photos are your Friend – Learn how to use them. Good advice. Kate is a huge fan of stock photos. She said, “I think that they give energy, complexity, and beauty to slides.” I agree with her. Utilize Design Basics such as using white space, sticking to a color theme, don’t use more than two fonts,lLook for natural lines on an image slide where you could add text, and many more. Then let your creativity flow. You can do it! The information was great and relevant to the audience in the room. But Kate sold it. She has personality, creditability and she made it fun. You wanted to listen. You can tell she is passionate about what she does. It came through in her presentation. 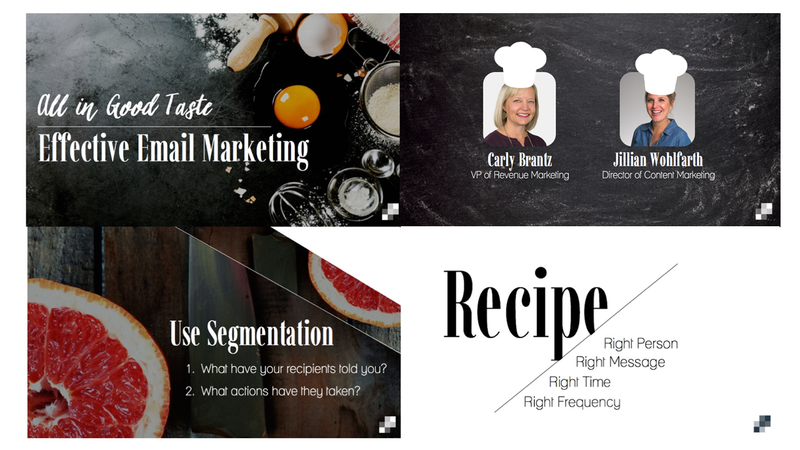 She rocked it – content and presentation. I can’t wait to see what she does next. You can reach Kate Schmeisser via email. Connect with her on LinkedIn. If you want to learn more about how to use imagery, watch Nolan Haims’webinar on Using Imagery to Create Powerful, Impactful Presentation Stories.